A Sussex County resort plans to fill 30 seasonal jobs with Paterson residents. Hired residents will be provided transportation from downtown Paterson to their work destination 30 miles away in Hamburg. 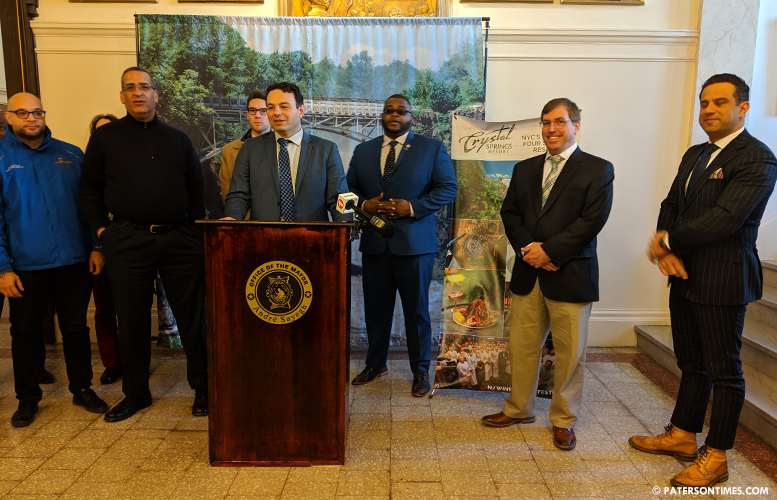 Crystal Springs Resort, which has a more than 4,000-acre resort in Sussex County that offers golf, spa, dinning, and much more, wants to fill the positions within a month, said its chief operating officer Robby Younes (pictured, far right). Jobs are in areas of culinary, hospitality, accounting, and sales, he said. Jobs pay a minimum of $10 per hour, said Mike Powell, economic director for Paterson. 20 people have already submitted applications for the jobs, said Powell. He wants to drive down the city’s unemployment rate which stood at 6.3-percent in October, almost twice the New Jersey average of 3.6-percent, according to the Bureau of Labor Statistics. Powell said mayor Andre Sayegh and Younes have known each other for years. Sayegh said he met Younes in 2003. At the time, Younes owned a business in South Paterson. “During the campaign I talked about relationships and how we were looking to leverage relationships to get positive outcomes for Paterson,” said Sayegh. He said the 30 jobs is an example of one of his relationships delivering for Paterson residents. Sayegh said Younes reached out to him after he became mayor and told him he has positions open to hire Paterson residents. The mayor said he jumped at the opportunity to get Patersonians working. It’s been tough to find workers in the current economy. Unemployment is the lowest it has been since the 1960s. Just today, the U.S. economy beat expectations, yet again, in adding jobs, according to data from payroll processing firm ADP. For more information or to apply visit https://www.crystalgolfresort.com/PWDP. Trump's roaring economy has unemployment so low they have to truck in workers from Paterson. What a President! They cannot find no one in Hamburg so they come to the city and pay you a whopping 10 an hour. Why not 15 an hour that what NJ is toting now. For you to be going that far 15 an hour should be the rate. They will work you like a dog also. why don't they do the same as trump does for his place in florida? oh wait they would have to pay way more than $10.00 in nj. plus file a lot of paperwork. living wage for paterson? not so we are still on the hook for the goverment services. does this job require english or broken english. $10/hour? You can do better than this, Crystal Springs Resort! When the bus break down on the road in Hamburg they will leave you there for the bear. You will probably get bear spray to take with you on the ride. I will hope that you won’t have to pay for your own bear spray you will need one.